Natural progesterone cream increased penetration. Hormones structurally identical to those produced by the body. Approved infertility treatment for women. Effective for treating amenorrhea in pre-menopausal women. 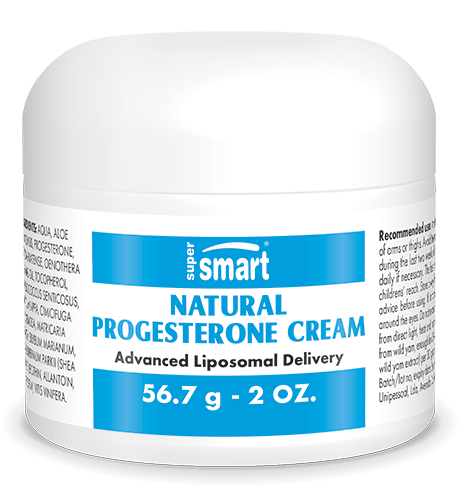 Here is the first Natural Progesterone cream with a liposomal penetration system. Liposomes are lipidic micro-spheres which help transfer active ingredients through the skin layers much more easily than the large molecules found in traditional creams. Thus, when the cream is applied to the skin, natural Progesterone is quickly absorbed into the subcutaneous fat, then more slowly into the blood stream without being intercepted by the liver. After a few weeks' use, the blood levels of Progesterone return to normal and are stabilized due to the hospitality of the organism for this natural hormone. Natural Progesterone can correct hormonal imbalances, pre- or post-menopausal, as soon as they appear. It contributes to reducing the unpleasant symptoms of premenstrual syndrome and menopause. It helps to prevent osteoporosis: In a study carried out by Dr. J.R. Lee, who, for three years, treated women of an average age of 65 years with an application of a natural Progesterone cream, found their bone density had increased by 15,4%! If during the same period these same women had not been treated, they would have experienced a 4,5% loss in bone density (Lee JR. Is natural Progesterone the missing link in osteoporosis prevention and treatment? Medical hypotheses, 1991, 35 : 316-318 ). Natural Progesterone also helps to prevent breast and endometrium cancers, cardiovascular diseases, and many other problems associated with female aging. Each 56.7 g pot contains 1.16 g of natural progesterone extracted from wild yam, enough for 24-48 applications. Provides 580 mg of natural progesterone (derived from wild yam extract) per 30 g and 24 mg per quarter teaspoon.